Discussion in 'Wiki Discussions' started by May, Jun 18, 2015. W Mission Story: Pokémon Ranger - The Comic (W ミッションストーリ ポケモンレンジャー the Comic) is written by Hidenori Kusaka and illustrated by Satoshi Yamamoto. 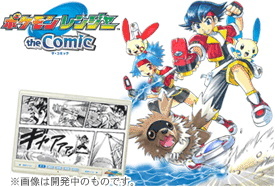 This manga was released the same day that the Pokémon Ranger videogame was released in Japan but was available online only for the members of Pokémon Daisuki Club. This manga is based on the W-Mission of Pokémon Ranger and follows the adventures of the two Top Rangers Lunick and Solana.